hydrographic survey, which has become thousands of miles away. In 25 years 1989. He anticipated ? eets of autono- one of the most common missions today. hundreds of new unmanned maritime mous vehicles roaming the ocean over vehicles have been developed. They long time scales and collecting unprec- have crossed oceans, discovered ship- edented new oceanographic data sets. In recent years ASVs have prolifer- wrecks, found mines, and surveyed hun- Now, 30 years later, with the ongoing ated, especially small systems for shore- dreds of thousands of miles of sea? oor. success of unmanned undersea, and side use. In the domain of ocean-going Henry Stommel’s visionary article, surface vehicles, Stommel’s vision has systems there are fewer players. ASV The Slocum mission, was published in been demonstrated, if not achieved. ASV to provide varying and proven so- lutions to the market for operations in an inland, coastal and offshore environ- ments. They have delivered more than 100 autonomous systems to more than 60 customers in 15 countries. 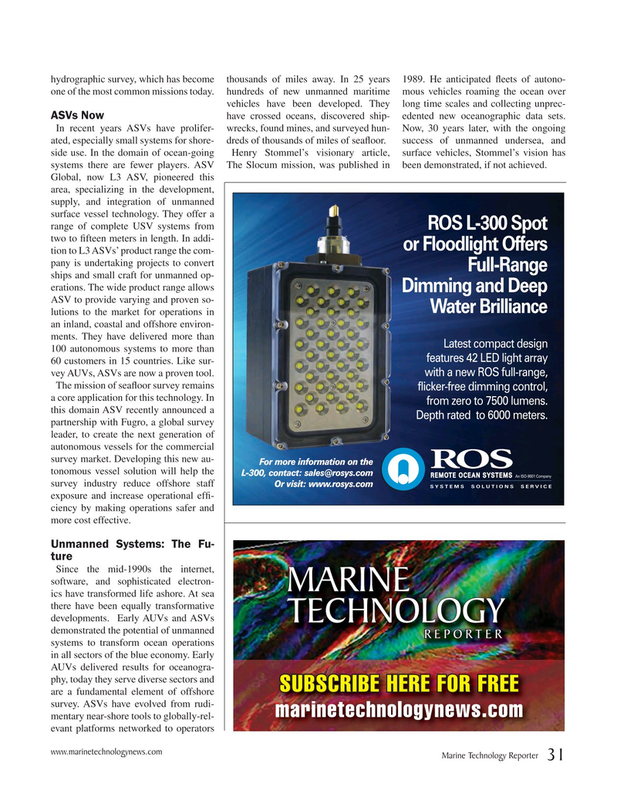 Like sur- vey AUVs, ASVs are now a proven tool. The mission of sea? oor survey remains a core application for this technology. In this domain ASV recently announced a partnership with Fugro, a global survey leader, to create the next generation of autonomous vessels for the commercial survey market. Developing this new au- tonomous vessel solution will help the survey industry reduce offshore staff exposure and increase operational ef? - ciency by making operations safer and more cost effective.